The built environment that most of us live in seems to come down to blocks of concrete. Blocks that look like building, blocks of walkways, blocks of plazas. Sometimes they look like they have been dropped from the sky and perhaps that’s how they were planned. More recently, we’ve seen steel and glass being used in ever greater amounts to break up the greys and mauve colours of concrete. There are also flats and offices which are arranged like square or individual, bite-sized boxes for work or living. Gospoda is Polish for restaurant. Appearances can be deceptive. 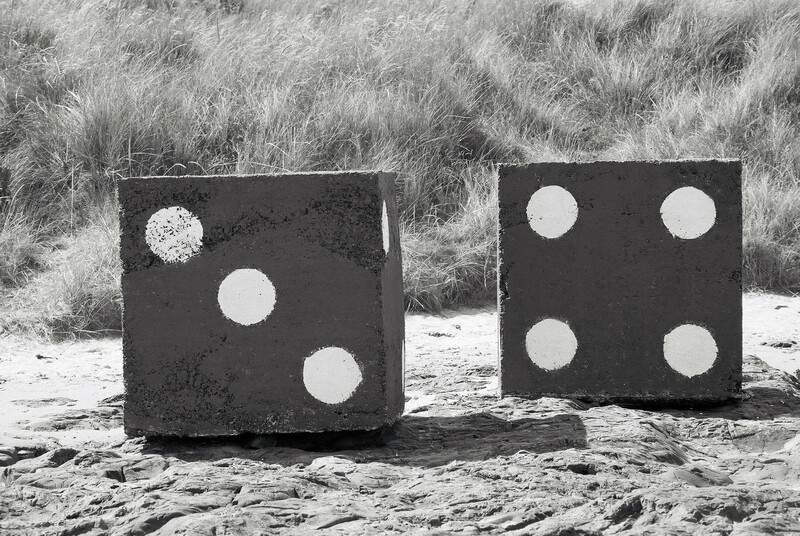 These dice are actually five foot high concrete blocks painted red and white. I photographed them on the beach at Bamburgh with my Canon EOS5.